Minimal fixed point operators were introduced by Scott and De Bakker in order to describe the input-output behaviour of recursive procedures. As they considered recursive procedures acting upon a monolithic state only, i.e., procedures acting upon one variable, the problem remained open how to describe this input-output behaviour in the presence of an arbitrary number of components which as a parameter may be either called-by-value or called-by-name. More precisely, do we need different formalisms in order to describe the input-output behaviour of these procedures for different parameter mechanisms, or do we need different minimal fixed point operators within the same formalism, or do different parameter mechanisms give rise to different transformations, each subject to the same minimal fixed point operator? Using basepoint preserving relations over cartesian products of sets with unique basepoints, we provide a single formalism in which the different combinations of call-by-value and call-by-name are represented by different products of relations, and in which only one minimal fixed point operator is needed. Moreover this mathematical description is axiomatized, thus yielding a relational calculus for recursive procedures with a variety of possible parameter mechanisms. 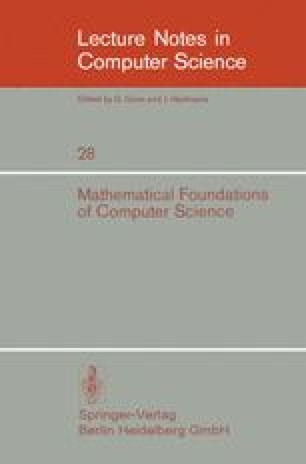 This publication is registered as report IW 23/74 of the Mathematisch Centrum.